What Prevents You From Stepping ahead of your Competition for 2009 Profits? What are some of the things that prevent people to improve their online business? Let's talk about a few. Have you ever felt like your life was just rushing all around, being overly busy but not really making any new progress. It has gotten to be a cliché about "life being to busy" but the truth is everyone's life is usually very busy these days. When you really think about it though, we usually do make some time for the things we consider to be of most importance to, don't we? And then there things that are less important we may mentally respond by saying, "I can't do this, I'm just too busy." When it comes to improving your online Web site so that it is making better profits, there is quite a bit of truth that can make a huge difference in your visibility to a whole world of buyers. Not just any audience, but the ideal audience for your business or businesses. Someone wrote to me and asked me for a quote to come visit their team on-site and train their staff privately on certain high performance topics. I agreed to help, (a couple months ago now) and I did travel to their business to help teach them and was pleased to help fine tune their skills. "John, what we learned when you were here has been priceless. We set a record day yesterday and had a record month for January. Great stuff! I hope you are well. I would have been in touch sooner, but our business has exploded and we have not had a free second until now." Keep in mind that these are Webmasters who already know about Web sites and who were doing some things fairly well. But in a competitive market there is a real squeeze at the top and that's where they wanted visibility. So then what could they possibly learn in 3 days that made their visibility and their sales fundamental so fast? Now they are taking new greater profits as a result of their decision to take action.. The key word in this is that "they made up their mind." They did not remain indecisive or continually change their mind about the direction they wanted their business to go in. Many people have difficulty making up their mind. Some will tend to put off a decision that will improve things. Actually, this company just invested in their own success. I assisted them with some specialized knowledge and and just a little coaching, which raised their understanding of SEO by 100 % in accuracy far higher than their competition. In another different conversation I had recently with a different business owner, about the options they could follow to gain the superior SEO accuracy skills it was also quite interesting. Once you are readily armed with SEO skills you can literally head in many different paths. I know some SEOs offer services just compliment working with affiliates. Others work with Blogs. Some may subconsciously looking to start a brand new business serving clients. Some may focus on optimizing a Web site they already own. You do need an abundance of knowledge and the wisdom to apply it. If you understand how to generate traffic that converts, you can head in any number of careers according to your interests. Personalized SEO skills with mentoring from experts who know what is up to date is the fastest way we have found for the student to make a difference for their business quickly and really retain the information well. There are different ways of learning though. You can study online courses. They said they were able to travel, they said they did have the budget. But the one reason this won't happen very soon, is because of the common philosophy that lots of folks have. It's the philosophy that "life is too busy." This philosophy is one that chokes many folks from ever getting started. There are other reasons too. But this is one of the biggest. Some people convince themselves that they are "too busy" to learn. Sometimes it's just human nature to fall into repetitive habits and doing the same thing over and over for years, never understanding that there are lots of smarter ways of doing things just a little bit differently. This is true especially in the SEO industry. Most of the SEO Professional educators keep coming back to class each year, because they want the latest new strategies. Some may convince themselves that SEO just too tough or it is too technical to learn something new. They basically believe it's too hard (based on what they've heard others say,) but they never give themselves a chance to get started. Some may think there is nothing new they could possibly learn. They subscribe to all the newsletters and forums and so they develop and build the idea up in their mind that nothing much changes in SEO. But there are more new things happening quite aggressively in 2009 and those who are already successful and sell more are those who have kept their skills up to date. Things have changed quite a bit since 2007 and even more in 2008. But it's never to late for companies or individuals to start increase cash flow and income as they make investments today for their own success for tomorrow. Sometimes regardless of where you are at, it is good wisdom to focus on identifying habits, behaviors or challenges that prevent us from taking simple steps that will improve your business model. Here is somewhat of another popular idea or misconception for some folks. Some people may be experiencing business being a little slower in this economy. If business is slow they may make logical cut backs as required. They may spend their dollars more cautiously. The newspapers proclaim bad trends and for sure, some people will just be unable to immediately have the funds for upgrading their skills. It's easy to understand this thinking and for sure some people may not have the resources. But then if you consider your business truly being rather slow right now or perhaps it just feels too competitive, as was in the first scenario, then this is exactly why you might consider it in reverse. If you want to get out of the rut and turn the tables then doing something that is different (that will put you back on top of the business) to the widest scope of your true audience is what you need most. If what your doing is not working online - you cannot keep doing it month after month - expecting better results. Now is the perfect time to gain those skills and take advantage of all of the knowledge available. If your online business is NOT making you any profit, it can not really be thought of as a business Website. It is more like a "hobby" than business until you get it turned around and making you some profit. Finally, a word of encouragement to those who may say they do not know how to write HTML and are afraid of learning something new. Sometimes newer people are startled by HTML. It sounds scary and technical. Some are not really afraid of learning, but they are continually putting off the idea of taking that first step to get started. Some will buy books, some will buy programs some will hang out in the forums and none of these are bad. But the most important thing will be for to identify what it is that prevents you from getting started. The truth is you don't (DO NOT) need to become a programmer to learn Internet marketing and SEO. Yet I hear this all the time. I'll ask that question again. What Circumstance Prevents You From Stepping ahead of your Competition for 2009 Profits? What's most important to you related to your business? Do you need help with new solutions for genuine search engine business? That is what we do every month at Search Engine Academy. We help small groups of ordinary business people to gain the understanding they need to win. 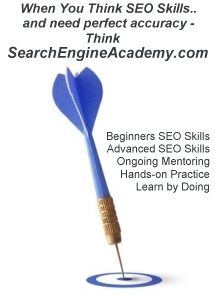 We teach beginners, intermediate as well as highly advanced SEO skills. Our trainers teach locally in a community near you or you can ask any of us for a quote to come to you. Now is the perfect time to invest in your own success. It does not take long to turn things around once you make up your mind to move forward. Check here for local upcoming dates - or contact any one of our local Search Engine Academies for a quote for on-site SEO skills training. Be sure to check our partners page to confirm that they are legitimately part of our team with all of our most recent SEO research and updates added. We are always happy to hear from our readers if they have any questions. "Excellent class. Wish I had found you guys 2 years ago!" "The ideas presented here have me thinking about website optimization, writing, search engines and research in new ways. I got much more out of the workshop than I would have imagined. I also wanted to say that the quality of individuals at the workshop is a real testament to you, Robin, Michael and the rest of the Search Engine Workshops team. Thank you for taking the time to make a personal impact. Your presentations have a remarkable way of reaching the individual while still speaking to the entire group. I felt that comments were for me individually and the group as at whole. With the entire 3 Day Advanced Workshop...Color Me Impressed." I wanted to extend my gratitude, and appreciation for all the valuable SEO information that you presented last week. THE BEST I HAVE EVER SEEN! I respect the fact that you, and your associates are not just teachers, but you are doers. I also like the fact that you have hands-on experience, and are out there evolving with this industry as it emerges. You guys demonstrate a longer term opportunity, with an expanding foundation that has a great deal of substance. Again, many thanks for your time, and attention. It was a very worthwhile week! John Alexander is Director of Search Engine Academy offering live, SEO Workshops in local business communities all across North America and Asia. John and his partner SEO educator Robin Nobles, author of the very first comprehensive online search engine marketing courses provide comprehensive instructor led classes as well as self study classes to. John is author of an e-book called Wordtracker Magic and has taught SEO skills to people from 87 different countries world wide. John's articles can be read in publications like REALTOR Magazine, Search Engine Guide, WEBpro News and many others.